In the early 1900’s, things seemed very different, At the beginning of the 20th century diamonds were discovered in the desert area just outside Lüderitz. Sometimes these diamonds lay fully exposed on top of the sand. This caused a diamond rush from all over the world and the once desolated lonely desert was engulfed with the influx of fortune seekers. 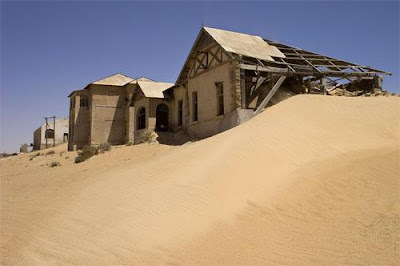 Out of this desert grew the elegant town of Kolmanskop, which included facilities like a casino, theatre, skittle alley, butchery, bakery, soda water and lemonade plant, swimming pool and a hospital with the first x-ray machine in the Southern Hemisphere. Some 700 families lived in the town, including about 300 German adults, 40 children and 800 Owambo contract workers. Each morning the ice – vendor came down the streets, which were even then smothered with sand, to deliver the daily ration of ice blocks and cold drinks to each household. Wages were good and virtually everything was free, including company houses, milk deliveries and other fringe benefits. Shortly after the drop in diamond sales after the First World War and the discovery of richer deposits further south at Oranjemund, the beginning of the end started. 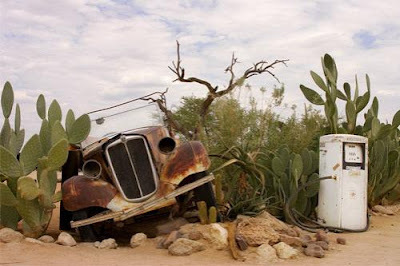 So within 40 years the town was born, flourished and then died. 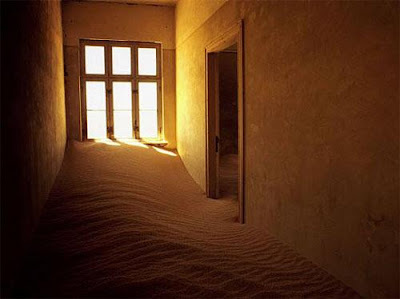 One day Kolmanskop’s sand-clearing squad failed to turn up, the ice-man stayed away, the school bell rang no more. 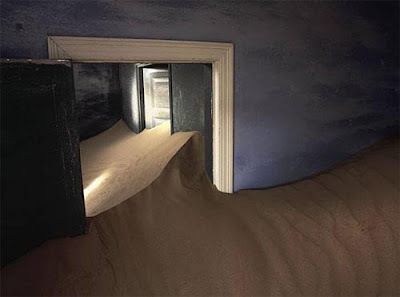 During the 1950's the town was deserted and the dunes began to reclaim what was always theirs. A couple of old buildings are still standing and some interiors like the theatre is still in very good condition, but the rest are crumbling ruins demolished from grandeur to ghost houses. One can explore the whole area within the fences and it creates the perfect set up for good photographic opportunities. It is important to buy special permits before visiting the town. Permits can be bought from the travel agency next to Pension Zum Sperrgebiet in Lüderitz. The area is still mined and it is part of the ‘Sperrgebiet’ (Restricted Area). 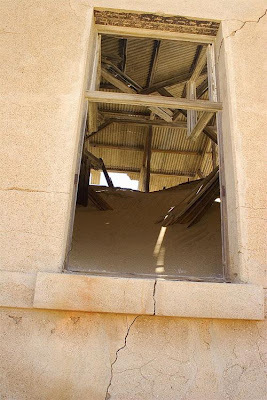 Visitors who apply for a permit must prove that they have no criminal record. Tourists must provide their own transport from the town. 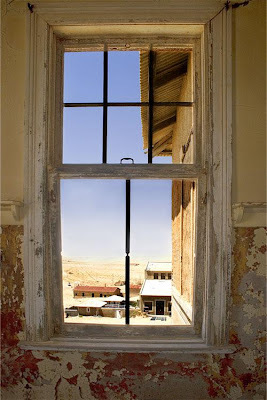 To get to Kolmanskop, drive east on the B4 from Lüderitz for some 10 km and turn south on a well sign posted road. 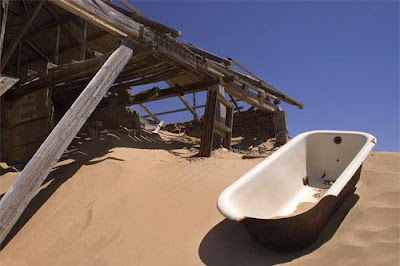 The other ghost town in the Namib Desert is Elizabeth Bay, but tourists are not allowed to visit it. 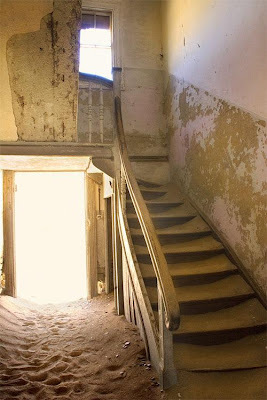 In short : Kolmanskop is a ghost town in southern Namibia, a few kilometres inland from the port of Lüderitz. 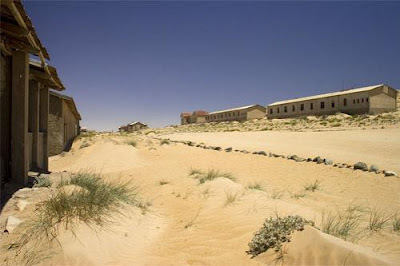 In 1908, Luederitz was plunged into diamond fever and people rushed into the Namib desert hoping to make an easy fortune. 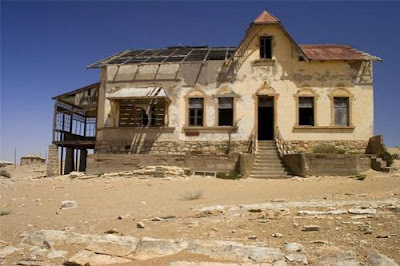 Within two years, a town, complete with a casino, school, hospital and exclusive residential buildings, was established in the barren sandy desert. But shortly after the drop in diamond sales after the First World War, the beginning of the end started. 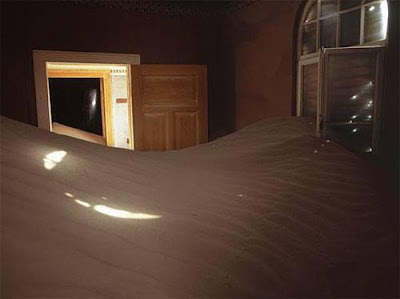 During the 1950’s the town was deserted and the dunes began to reclaim what was always theirs. The place in the photograph is looking very dangerous. 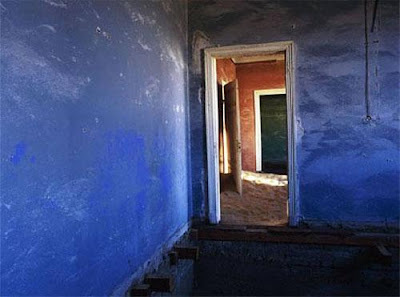 It is really looking like ghosts place.